The Greater Bandon Association is a 501 (c) (3) non-profit organization dedicated to enhancing the area’s relaxed coastal living. Through it economic and community vitality work, it is making for a Greater Bandon. You can support its work by making a personal financial contribution at a level that is meaningful for you! This past year has been an exciting one for the community and our organization. Nationally, the Main Street Approach is being refreshed. Bandon and GBA was chosen to be the pilot community in Oregon to implement the refreshed Main Street approach this year. Through surveys, focus groups, public meetings and market research, GBA revisited Bandon’s community vision and market realities to develop economic transformation strategies that are being implemented currently and will guide our community work in 2019. While the Main Street approach has been refreshed, the four main points of the approach remain the same. They include organization, promotion, design and economic development. With promotion, we try to bring both visitors and residents into our shops and businesses with activities that show off what our community has to offer and that bring our community together. Three initiatives are helping us achieve that. Our monthly activity, Alive After Five, includes a wine walk and entertainment for locals and visitors alike. We sponsor the Gorse Blossom Festival, which brings in outside money to our restaurants, hotels, and shops during the off-tourism season. And this month, we will continue our tradition of lighting the community Christmas tree for the sixth consecutive year to kick off the holiday season in Old Town Bandon followed by a lighted Christmas Parade two weeks later. Regarding economic development, we have focused recently on bicycle tourism. We were a major partner in the Bandon Cycle Stop Rest and Repair Project, a partnership between the City, the Port, and our organization to provide bike parking, maintenance, and storage in Old Town. This past year we added stainless steel lockers with power and USB ports to recharge devices as well as a water dispenser to refill bottles for cyclists travelling through Bandon to store their belongings or purchases in. The addition of the storage allows visitors to freely shop and eat in Old Town knowing that their belongings are securely locked and safe. In revitalizing our town, we also have focused on preserving our unique assets. 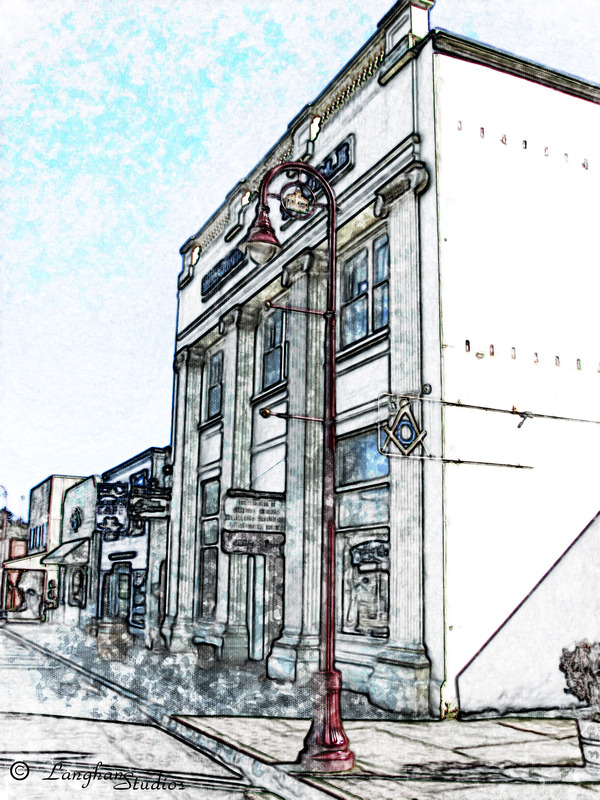 One gem that survived Bandon’s fires is the Masonic Building in Old Town which at the time was the First National Bank Building. With a $100,000 grant award that we received, the building owners were able to make badly needed structural and exterior façade repairs to the building. In 2019, we become eligible for another $200,000 grant to repair and rehabilitate our historic buildings. Finally, like any organization, we still have operating costs to maintain. To the extent possible, we hope to sustain support for these costs by allocating local donation and fundraising dollars that we receive for that purpose. As much as possible, we will continue to rely on volunteered labor, supplies and materials, and community goodwill to help in our efforts. Thanks for helping us as a community builder in making a difference!